Jamaica -caught between a rock anda hard place: Bruce Golding or Portia Simpson-Miller? In the summer of 2007, Jamaicans went to the polls and decided that after 18-plus years of PNP rule they wanted a change. They voted Bruce Golding and the JLP into power and, in the process, made Portia Simpson Miller’s stint as PM one of the briefest. She became Jamaica’s first female party leader and female PM and two-and-a-half years later she was fighting for her political life: her party lost power and her leadership and her (cap)abilities as a politician were being questioned/challenged. With regard to the JLP, Bruce Golding had no such worries. He was the undisputed leader of the JLP and he had no rivals for his position in the party hierarchy. 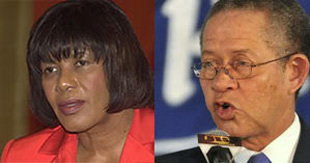 Bruce proved in debates and on the stump that he had a full grasp of the issues when compared to his PNP counterpart. He also talked about being different and transformational and either said or implied as much that any government he leads would be different and transformational. Fast forward to just a tad over two-and-a-half years later and just how much different and transformed has Jamaica become under a Bruce Golding-led JLP government? The answer, unfortunately, is nothing has changed for the better. 2009 saw more folks murdered in Jamaica than any other year and with close to five people being murdered daily, on average, there could be anywhere from 1,800 to 2,000 Jamaicans murdered in 2010. The murder rate has been talked about ad infinitum/nauseum in the two principal Jamaican newspapers and it has been discussed in other fora and by and within the diaspora. Anti-crime bills are languishing in Parliament and there is no sense of urgency in passing them. You have a corruption- and criminal-riddled police force led by a ‘career’ cop when who is needed is a professional to lead it. One gets the impression that trying to clean up the JCF is a rather lonely job. You have a National Security minister who just seems to be a warm body in a position he’s not best suited for. There is no crime-fighting strategy that has been developed and implemented to tackle the wanton and widespread criminality that has become an all-too common occurrence in Jamaican society. The bottom line is that now more than ever, Jamaica is being talked about as a potential failed state and when reading some of the posters on the Observer and Gleaner websites, comparisons to Haiti and Somalia are being made. Corruption, an albatross around the neck of the PNP when it was in charge in the 1990s through the summer of 2007, is just as pervasive now that the JLP is in charge. Whether it’s the millions spent to spruce up the Transportation Minister’s abode or spent to spruce up the Tourism Minster’s office so that he can have a very comfortable chair for his posterior, among other things, there has not been much change. The Constituency development Fund (CDF), the JLP’s version of the SESP, is alive and well even when money is supposedly very tight and the country had to approach the IMF in order to stave off the equivalent of a bankruptcy filing. It’s hard to find money to pay civil servants and other government employees but there are millions available for the CDF so that MPs can continue buying votes. Whether it’s paying a US law firm to try and lobby the US government not to press for the extradition of a well-known JLP supporter for alleged drug-smuggling and gun-running and seemingly lying about the extent of the relationship with said law firm or otherwise behaving badly, things are not as they should be. What Jamaica has not had for some time now is true leadership. We’ve had folks proclaiming themselves as leaders but, as the saying goes, ‘self-praise is no recommendation.’ We’ve had the PNP folks talking about teaching younger folks about good governance and now they will be forming an ‘Integrity Commission’ to impress upon membership the fact that they will be held to account for sullying the party’s name and reputation. Among the members of this ‘Integrity Commission’ will be Omar ‘Run Wid It’ Davies. This is the same party wondering how to kick Kern Spencer out of its ranks but still has Phillip Paulwell in its ranks. The latter is the same cat whose name was linked, seemingly, to every major scandal to have plagued the party in the 1990s and earlier this decade when they were still in charge. For the sitting government, they have proven that 18 years in the political wilderness did not prepare them to lead when given the opportunity. With the exception of the Education and Agriculture Ministers, everyone else in the present administration seems to be clueless as to how to lead and that includes the PM. At a time when he should have hit the ground running when he became PM, Bruce Golding dithered and blathered and his finance minister belittled the severity of the economic storms that were about to hammer the Jamaican economy. In fact, his finance minister’s projections makes weather forecasting look like a more precise undertaking. Instead of being bold, decisive and proactive, Bruce Golding has allowed circumstances to force him into action. When he should have culled the government workforce from the git go he waited until the IMF told him that this would have to be done as one of the conditions of getting to borrow from them. Rather than having the courts decide the merits of the US extradition request in the Christopher ‘Dudus’ Coke matter he’s going to have them decide under what conditions his Justice Minister/AG can sign off on the request. Instead of telling one of his party’s senators that he cannot be an attorney for the subject of an extradition request and still be in the Senate but must either recuse himself from one of the duties, he has not. Not only is this a bad reflection on the government but also the JLP. Instead of being different and transformational, Bruce Golding has proven to folks that he’s like all the others before him – still old-school and tribalistic and too set in the old ways. The bottom line is that nothing has changed for either the PNP or the JLP. A political party should not have to form an ‘Integrity Commission’ to remind its officers not to do or engage in activities that will sully its image and bring it into disrepute. That should be one of the bedrock rules of a political party and of any organization, for that matter. A sitting government should not be defending someone accused of a crime but should let the courts decide on the matter. The last time I checked, Jamaica was still a democracy but, as recent events have shown, unless it’s something done in the athletic sphere, the reflection of Jamaica right now is not as it ought to be. I remarked in a previous article that for Bruce Golding, all that he hoped to achieve in life he has: he has become the leader of the JLP as well as PM of Jamaica. God forbid but if he were to drop dead today, he would have died a happy man. Today you have columnists in the Jamaican dailies who will write about how wonderful and masterful a speech Bruce can give on the economy but how does that help the average Jamaican struggling to make ends meet. One’s command of the English language or of matters of state does not mean squat if it’s not helping to provide food, shelter, clothing and jobs for me and my family nor does it help if me and my family are not physically safe from marauding and callous criminals. In other words, words ring hollow if they are not accompanied by action(s) and right now that’s Bruce Golding’s problem. Right now, Bruce Golding is a (bad) joke as a PM but no one in Jamaica finds him funny. Bruce, you should either step up or step aside.